Firefighters responded to a structure fire at 2158 Smyly Road Saturday morning 1-February at 01:26. The initial report came in as an automatic fire alarm from this location. First arriving units found the single story residential structure filled with smoke. Upon inspection, the breaker box was discovered to be on fire. Click here for more information. We offer condolences to the family of Firefighter-EMT Robert McAlhaney. Robbie’s mother, Elaine Weatherford passed away Sunday. Her visitation will be held at Avinger Funeral Home in Holly Hill on Thursday 30-January beginning at 18:00. Funeral services will be held at the Funeral home at 14:00 on Friday. Please remember them in your prayers. Dry conditions paired with low humidity and high winds set the stage for several woods fires throughout the county Saturday and Sunday. The largest fire occurred Saturday afternoon 25-January (14-00484) at 14:48 in the Springtown Community starting on Bent Gate Lane and burning north to Augusta Highway. Click here for additional information. 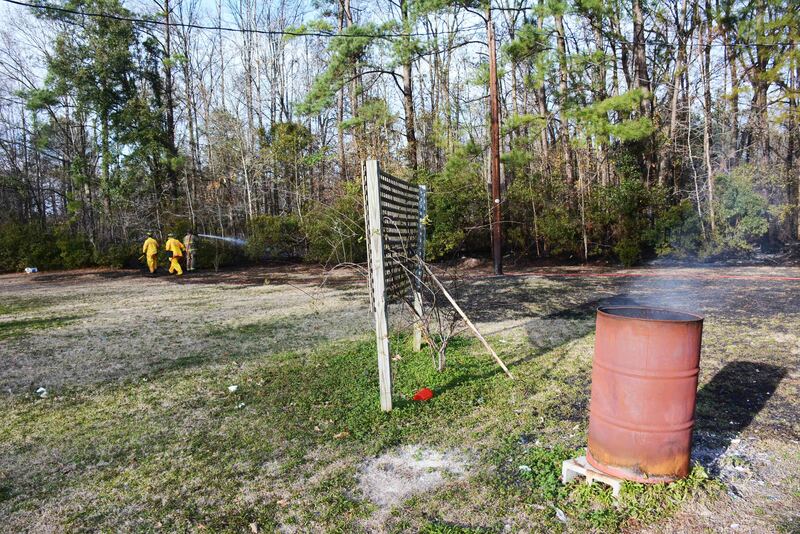 Firefighters saved a home Saturday morning 25-Janaury at 3416 Sidneys Road. 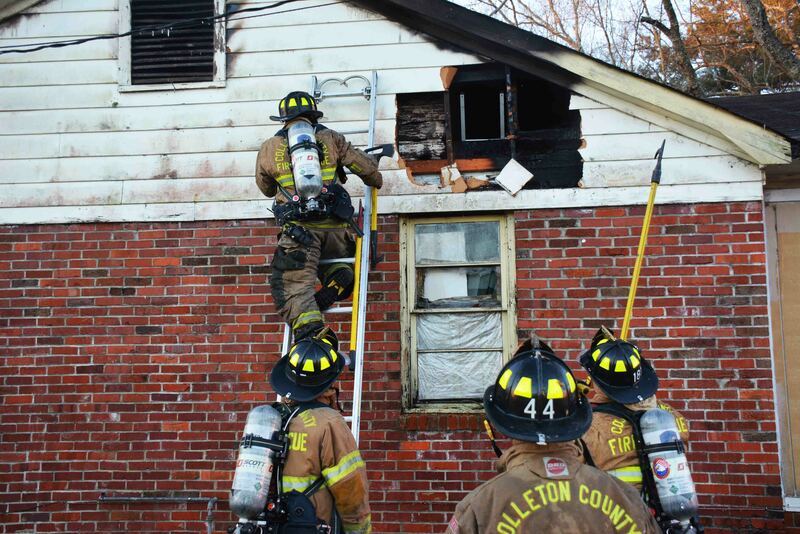 The fire was reported at 06:48 when the occupants discovered fire in an exterior wall and smoke in the home. Engine 19 arrived four minutes later to find fire venting from the eaves on the “B” side of the single story residential structure. Click here for additional information. 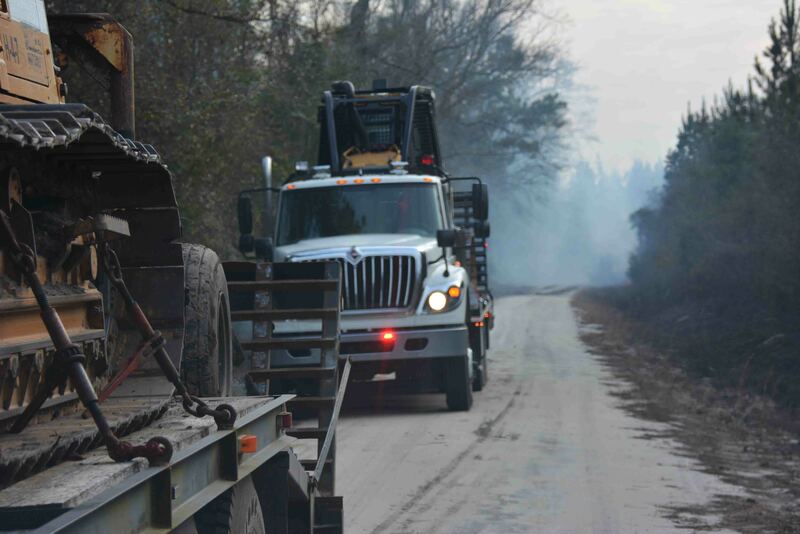 South Carolina Forestry Commission has issued a Red Flag Fire Alert effective Saturday, 1/25/2014 at 7:00 AM until further notice. 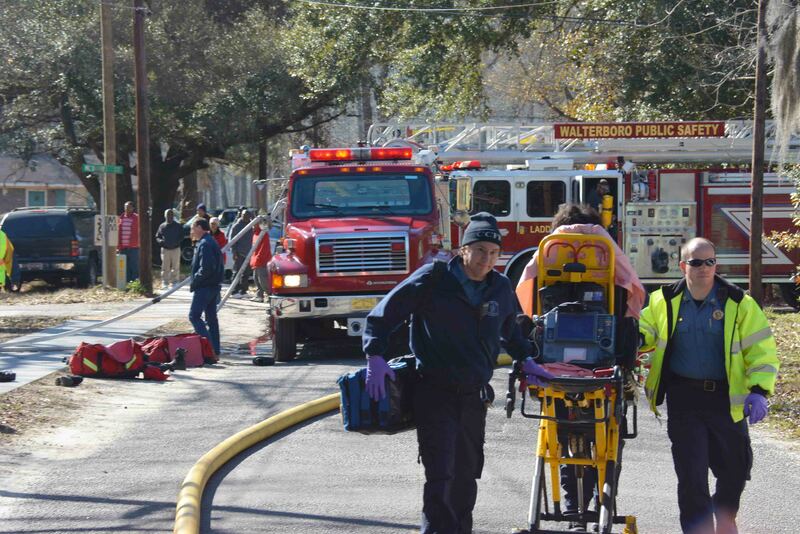 Three patients received burns as a result of a house fire at 202 McDaniel Street in the City of Walterboro Friday morning at 11:36. 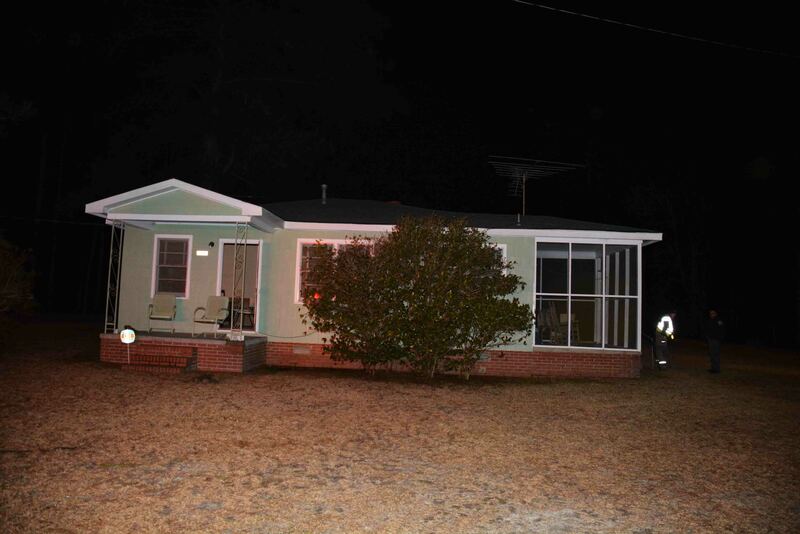 Walterboro Public Safety was notified of the residential fire at the corner of Girardeau and McDaniel Streets. First arriving units found the single story wood frame structure heavily involved. Click here for more information. Firefighter-Paramedic Jack “Slade” Evans was injured when his private residence caught on fire and burned Tuesday afternoon. He was asleep when the fire was discovered. He saved his cat and escaped with only the clothes he was wearing. Slade’s son was not at home when the fire occurred. His Clarendon County home was destroyed. Slade suffered second degree burns to his head, shoulders, upper arms and back. He was treated at McLeod Hospital in Florence, then transferred to the Still Burn Center at Doctor’s Hospital in Augusta, Georgia. He underwent surgery today. Chiefs McRoy and Greene went to Augusta Wednesday but were not able to see him. His family is staying with him at Doctor’s Hospital. At this point, we do not know what Slade and his son need. Right now we can all pray for his rapid recovery. We will keep you updated as we receive further information. Congratulations for Firefighter/Paramedic KC Campbell and his wife Bray on the birth of their son. Bryar Kenneth Campbell was born at 17:11 on 1/20/2014 at East Cooper Medical Center. He is 6 lbs. 14 oz. and 20 and 1/4 inches long. Both Mom and baby are doing great. Firefighters were called to the scene of a 55 gallon drum dumped on the side of the road in the 2800 block of Beach Road at the entrance to the Sandy Springs Subdivision Saturday morning 18-January. At 09:09, a caller reported to 9-1-1 that the blue plastic drum was laying on its side near a creek. 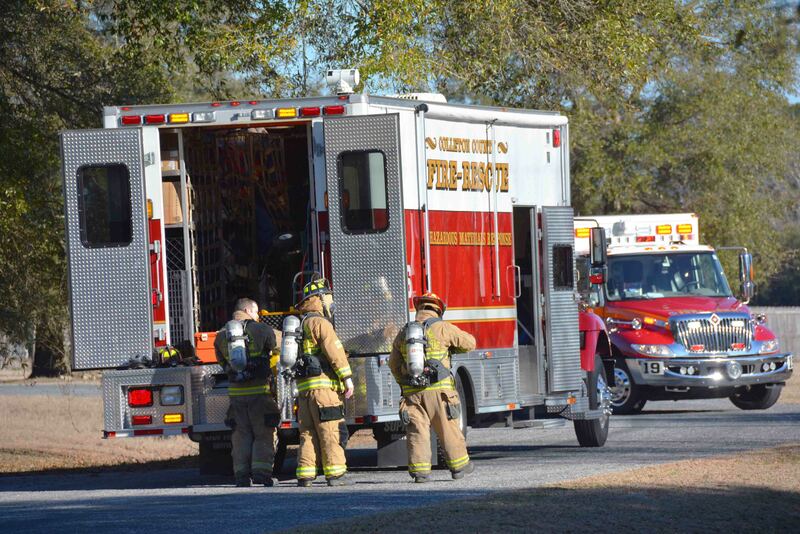 The caller reported the drum possibly contained chemicals.Click here for more information. 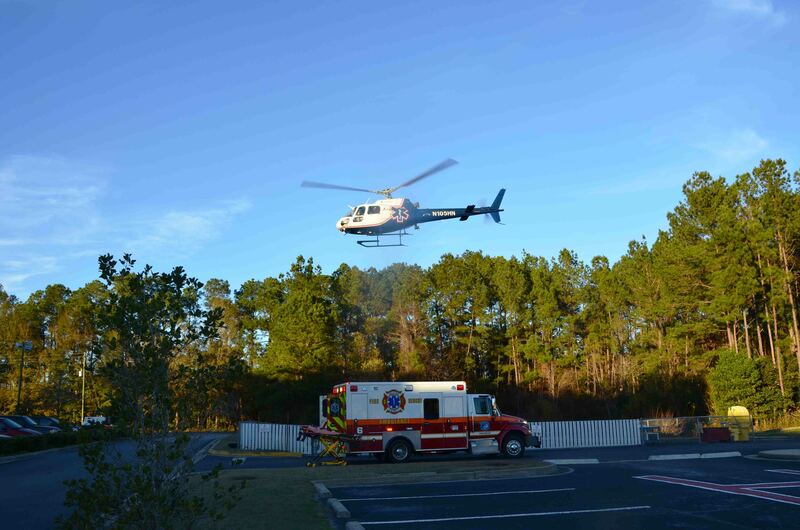 1/18/2014- The 3rd Annual Emergency Services Softball Tournament will be held March 29, 2014, at the Colleton County Recreation Center at 280 Recreation Ln in Walterboro. The tournament fee will be $250 (sponsors are encouraged). The teams must consist of Fire, EMS, Police, Power/Phone Company and/or Military personnel. Registration is due by March 14. To register a team, ask for more details or to play for Colleton County’s team, contact Brian Drew (843-909-3417) or Robbie McAlhaney (843-560-6187). A woods fire quickly escalated after winds drove the fire under two buildings behind a residence at 3220 Burlington Road Friday afternoon 17-January. At 15:23 Fire-Rescue was sent to the address on the report of a woods fire. Engine 19 and Medic 19 arrived to find a fast moving grass and woods fire with two buildings endangered. Click here for more information. 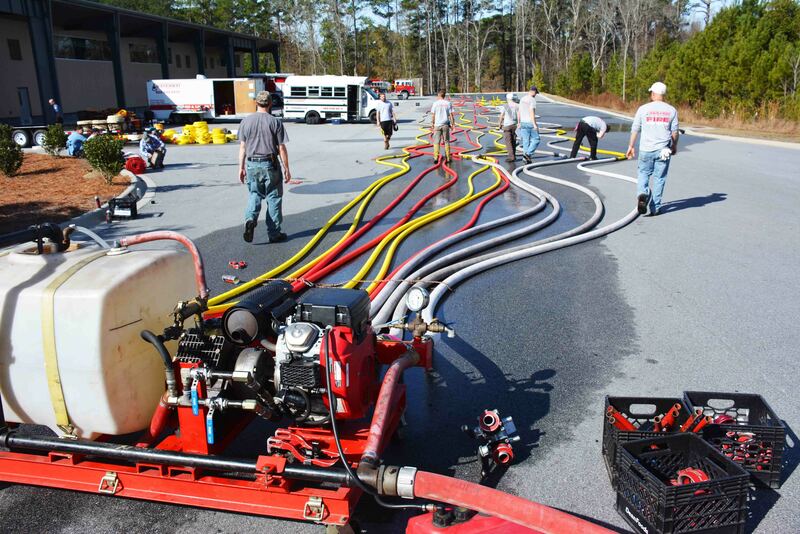 Personnel from Waterway of North Carolina came to Colleton County to test all of our hose. This is the first time our department has contracted the annual hose testing. The company brings their own pressure testing equipment, marks all of the hose and numbers it. Click here for more information. 1/17/2014- Fire-Rescue offers our condolences to the family of Mike Garvin, a past Colleton County EMS Director and active EMT/Paramedic Instructor, who passed away earlier this week. Mr. Garvin began employment with Colleton County as a Paramedic in October of 1980 and was promoted to the position of Director in October 1989. He retired from the post in Jan 1999. He is responsible for expanding EMS coverage into the rural Colleton communities in the late 1990s, when two new stations were constructed in Cottageville and Bells. 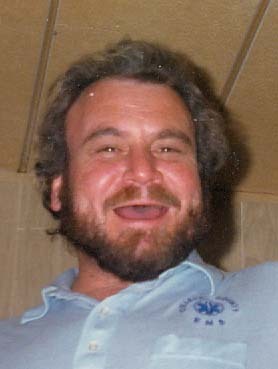 Mr. Garvin was well known and trained many personnel throughout the State, contributing to the EMS field statewide. Visitation will be held at the James A McAlister Funeral Home, 1620 Savannah Hwy, Charleston, SC, Sunday, Sunday 19-January from 16:00 to 18:00. Funeral Services will be conducted at St. Joseph Catholic Church, 1695 Raoul Wallenburg Blvd, Charleston SC, Monday 20-January at 10:00. Burial will take place at Smoaks family cemetery off of Cane Branch Road near Walterboro, Monday at 13:00. CCFR encourages everyone to review the following video regarding fire safety for 9-volt batteries. Click here to view the video. A 20 year old Georgia woman lost her life in a single car MVC on I-95 near the 41 mile marker northbound. The accident was reported at 09:12 Friday morning 10-January after the 2004 Ford Explorer drove off of the median side of the highway, over-corrected and lost control. Click here for more information. ALL CCFR PERSONNEL: Countywide Drills will be held on Saturday, January 18th at 08:30 hours at Station 19 and Thursday, January 23rd at 19:00 hours at Station 19. The training topic will be Search and Rescue. The training division would like to prepare necessary food and instructors for the number of personnel attending. You can register by emailing the training division at colletonfiretraining@colletoncounty.org , contacting the training division at 538-6849, or click on the "Drill Registration" option from the CCFR website quicklinks. Click here to view the 2013 CCFR Statistical Report. 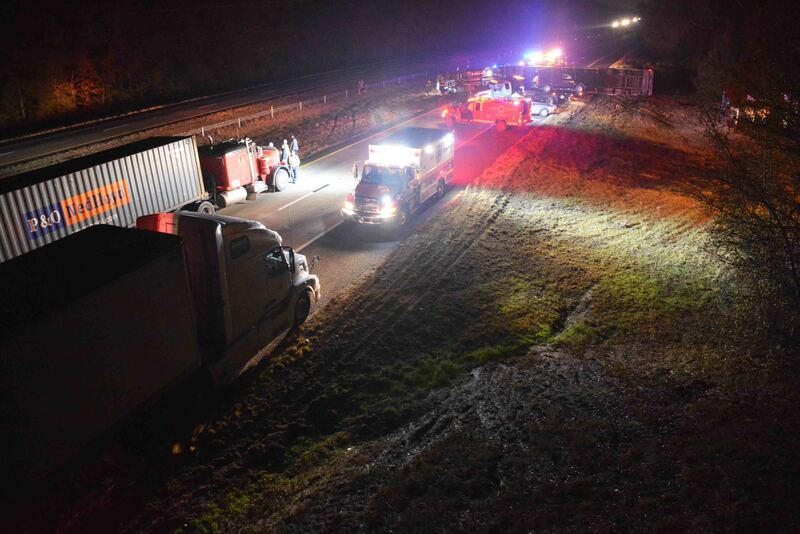 A four vehicle, high speed accident completely blocked I-95 northbound at the 50 mile marker Monday morning 06-December at 02:22. Witnesses stated a northbound tractor trailer side swiped another tractor trailer. The first truck lost control and over-turned blocking the northbound lanes. Click here for more information. 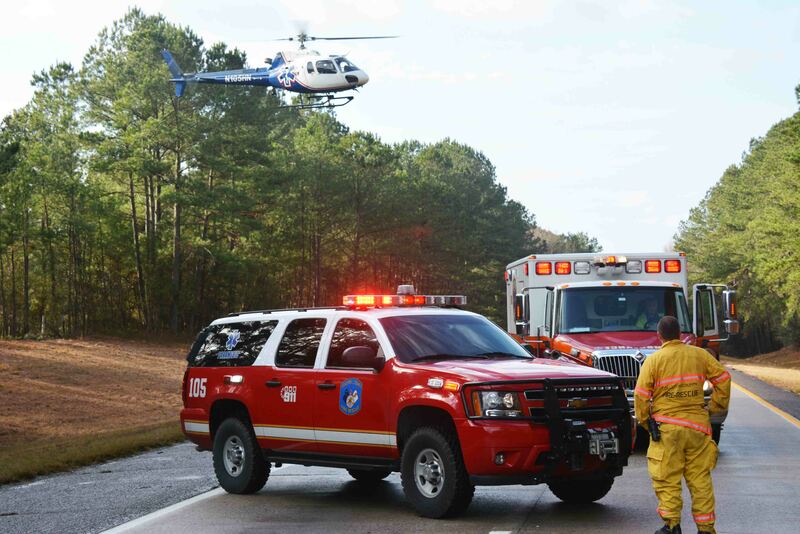 A 30 year old Charleston man was severely injured in a single vehicle MVC in the 3500 block of ACE Basin Parkway (US Hwy 17) Friday afternoon 03-January at 15:45. The northbound SUV left the roadway at a high rate of speed and struck an embankment in the median. The man suffered a head injury. Click here for more information. 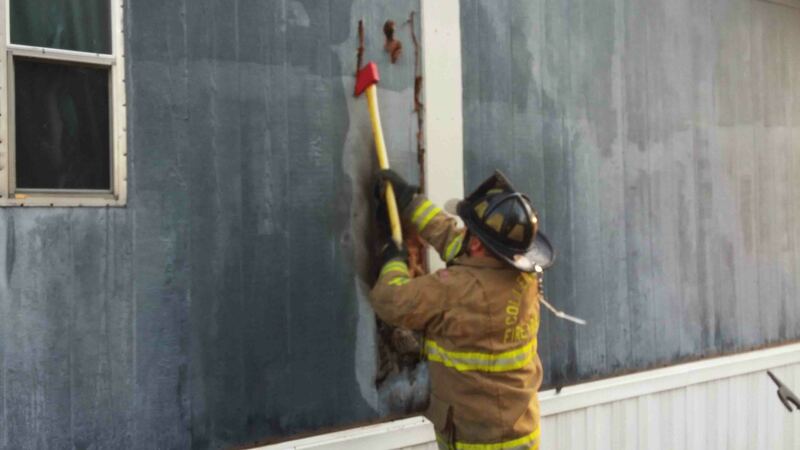 A fire in an exterior wall outlet caused moderate damage to a doublewide mobile home at 5248 Augusta Highway, Friday morning 03-January. Engine 17 arrived to find light smoke at the residence and was directed to the back of the home. Firefighters found flames extending up the back wall of the home. Click here for more information. We offer condolences to Firefighter Clovis Bell and his family. Clovis’ granddaughter, Evalon Zoe Bell, was born Christmas Eve in Charlotte, NC, but passed away later in the evening. The family plans to hold a funeral here in Walterboro at a later date. Information will follow as we receive it. Please remember the family in your prayers. 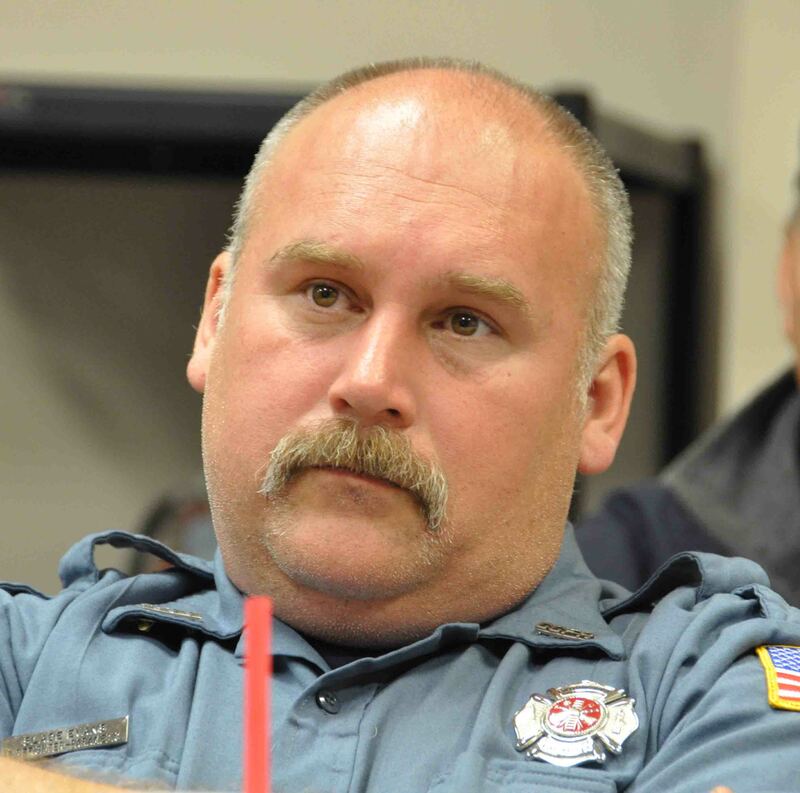 Our condolences go out to Battalion Chief Ben Heape for the death of his father. Visitation will be at Herndon's Funeral Home in Varnville on Thursday, January 2, 2014 from 1800 to 2000. The funeral service will be held at Faith Baptist Church in Walterboro on Friday, January 3, 2014, at 1100 with a graveside service to follow at Zahler Cemetary in Yemassee. Please keep the Heape family in your thoughts and prayers.